Spring has finally arrived in Toronto, and summer is around the corner. I find that as the produce gets more abundant at the market, and the herbs shoot up in our garden pots, creating meals becomes less deliberate and more improvised. I pick up ingredients out of sheer excitement to see them at the market, not yet certain of what I’ll do with them. But I find the second I get home, lunches and snacks and dinners come together in an effortless way. 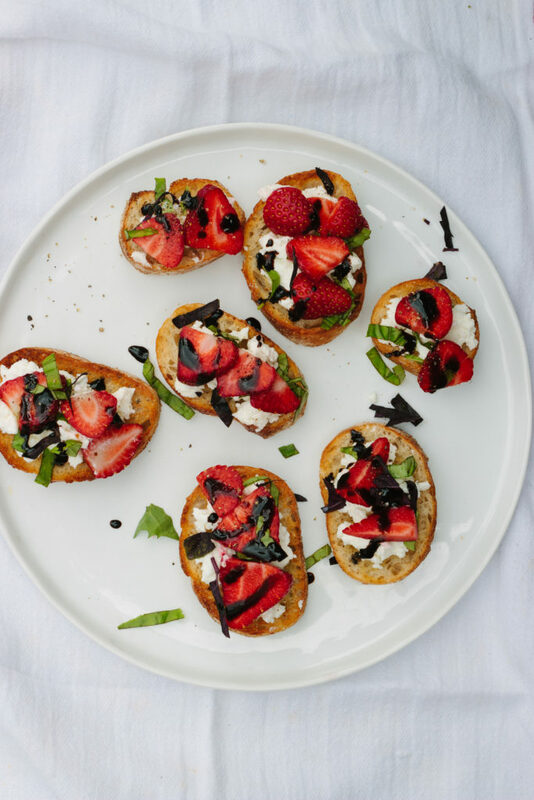 Food at this time of year should be deliciously uncomplicated, and these crostini embody this philosophy. Market produce, good bread, herbs, and something creamy, these are the foundation of the best meals of the season. This approach to cooking is a good approach I think to translate over to our lives this time of year. There’s such a pressure to plan, and pack our summers ahead with maximum commitments and activities. But our best summer nights often involve drinks on our back patio, and impromptu walks to local ice cream spot. I’m going to try to leave space to let things just happen, or not happen. Let summer unfold in that effortless way. To make the first 2 toasts vegan, you can sub both the goat cheese and ricotta for your preferred vegan cheese, although I feel like Laura’s amazing cauliflower and pine nut ricotta from The First Mess Cookbook would be particularly perfect. If you’re gluten free obviously use your favourite gluten free bread or crackers. But please do not use sweet potato. Some things are sacred. Preheat the broiler with an oven rack in the top third of the over. Brush all the slices with olive oil on both sides. 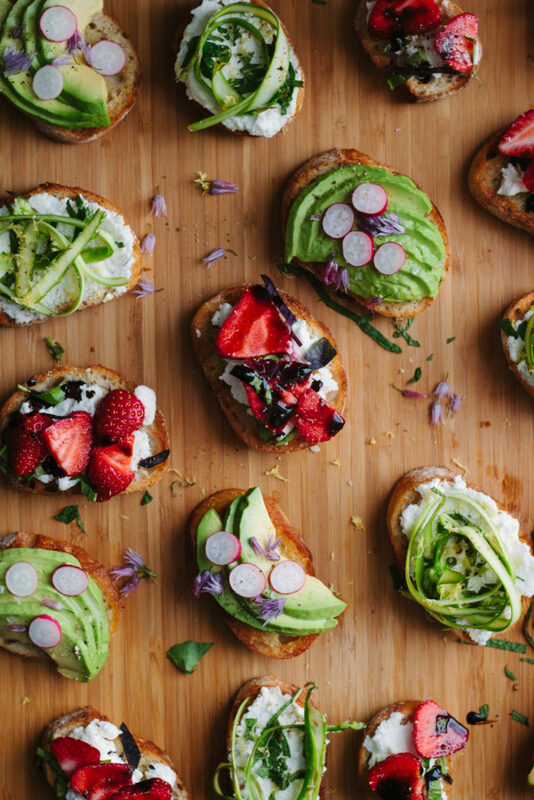 Once broiler is heated, bake the toasts on one side for 2-3 minutes, or until golden and slightly brown on the crusts, and then flip and do the same on the other side. Remove from oven to cool. 4-5 asparagus spears, shaved with a vegetable peeler into long thin strips. Zest the lemon (its easier to zest it before you’ve juiced it). 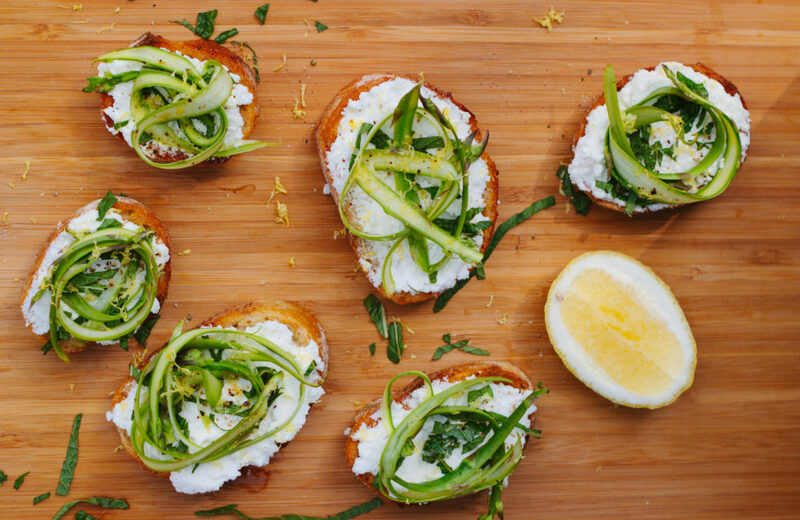 Spread toast with a nice spread of ricotta, season with salt and pepper, lemon zest, and a small squeeze of lemon juice on each one. 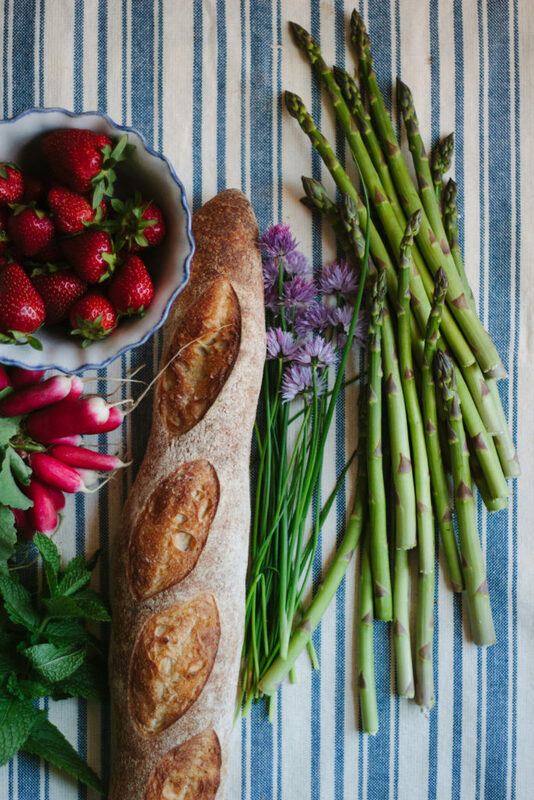 Place shaved asparagus on top (I find shaping them into a ring is easiest), and top with chopped mint and more lemon zest for decor if you want. fresh goat cheese (chevre) – about 3 oz. 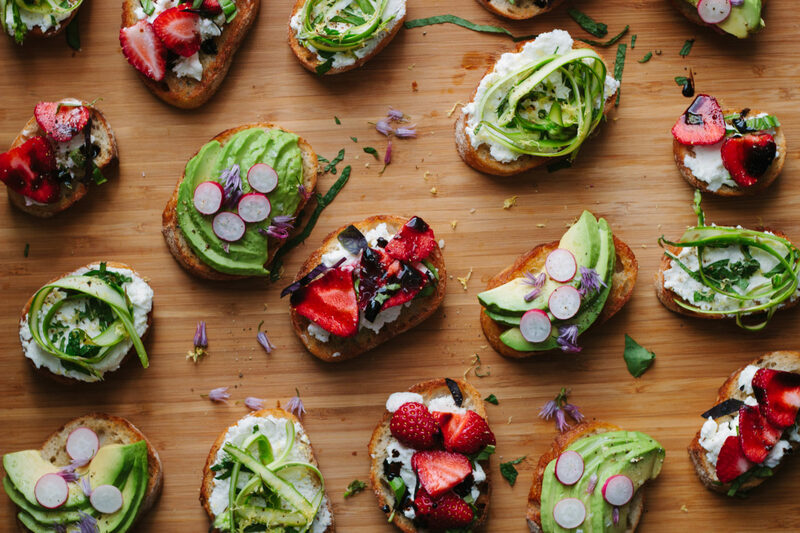 Crumble the goat cheese onto each toast. Thinly slice the strawberries and put on top. Season with salt and pepper. Top with some drizzles of balsamic reduction and chopped basil. 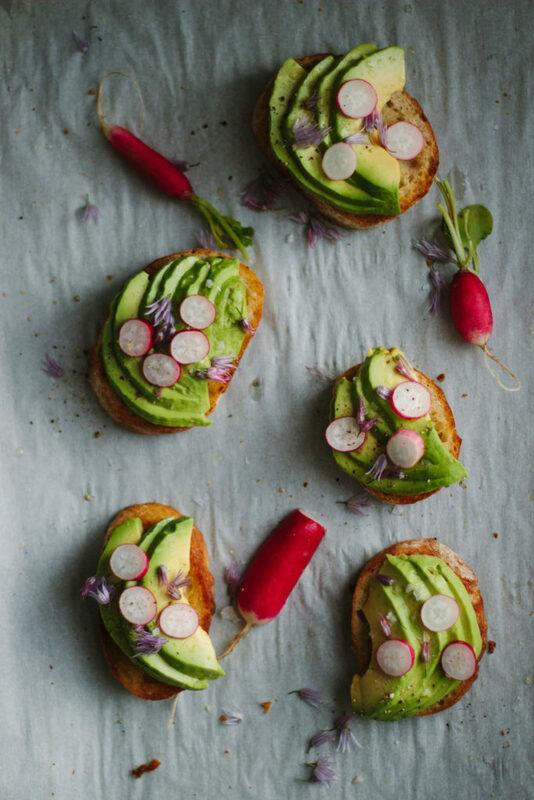 Thinly slice the avocado and place on toast. I find the easiest way to do this it to open the avocado, remove the pit, remove the peel, and then slice it with the flat side down. Top with a generous squeeze of lemon juice, flakey salt (or regular salt) and pepper. Slice the radishes thinly with a knife or mandolin, lay on top. Sprinkle with chive blossoms or chives. Haha, I love your Sweet Potato comment! Haha thanks! Don’t get me wrong, I love sweet potatoes. They just aren’t at all toast-like.